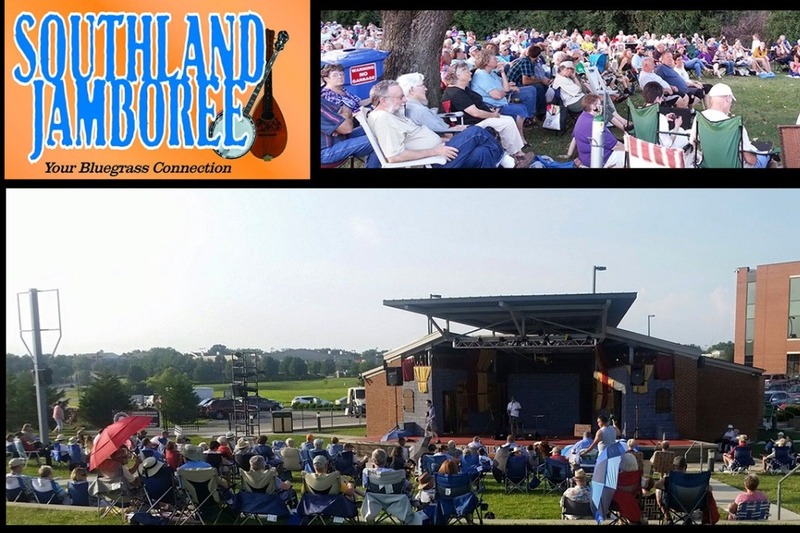 The Southland Jamboree in Lexington, Kentucky is a free bluegrass music concert series that has occurred weekly during the summers since about 2006, with Phil Wyant and Billy Sherrow assuming the reins. First performing in the grassy lot behind Collins Bowling Center, the Southland Jamboree moved to Lexington's Moondance Amphitheater in 2016 when the Collins location was no longer available due to building on the site. Originally sponsored by the Southland Association and operated through generous sponsorships from Southland merchants, financial support has diminished since the move to Moondance. Although Organizer and emcee Billy Sherrow announced the cancellation of the 2018 season due to lack of a larger sponsor, the response from the public via Facebook, etc. has been extremely supportive with offers of funds and hands-on assistance. One band even offered to play for free if the Jamboree continued (let's hope we don't have to take them up on that). Beth Tibbitts has volunteered and assisted Phil and Billy since about 2008 (including the website southlandjamboree.org and social media). With some fund-raising assistance from LexArts in Lexington (funds are deposited to, and administered by, LexArts), I would like you to "put your money where your mouth is." If we can raise about $8000 I believe we can rescue part of this summer's concert season, perhaps beginning in July. More, and we can assure continuation for the future. A full season costs us about $10-12000. I will also be needing hands-on help if this is to continue, and information about larger corporate sponsors is very welcome and would ease our worries for the future. Let's save the music, Lexington! January 21, 2019: we are suspending donations via GoFundMe. Between GoFundme, sponsors, and donations at the concerts in 2018, we raised well over our $8000 and have started to fund our 2019 concerts, which should begin in May 2019. Donations are still welcome; see our website at southlandjamboree.org for information on the upcoming season and how to donate, and THANKS for helping to save the music! Thank you for your donation to the Southland Jamboree during 2018 via GoFundMe. Without you and hundreds of other donors, the Jamboree wouldn't still be viable. were collected via LexArts (a 501(c)(3) organization). your name and address to do so. Please send your name, email address, mailing address, date of donation and amount of donation to Kristen Frost at LexArts, frost@lexarts.org. Please put in the subject line "Southland Jamboree donation letter request." Our new non-profit “Southland Jamboree Association” has been created and our executive board is in place: President Beth Tibbitts, Vice-President Billy Sherrow, Treasurer David Johnson, Secretary Laura Clevenger Smith, At-large member Ted Critchfield. We’ve heard from many fans that Mondays weren’t the best night out for music, Woodsongs performs on Monday nights and music fans want to attend Southland Jamboree *and* Woodsongs, and we’re hoping that our bands will find that Thursdays work out better on their way to other gigs. So Lexington Parks & Rec has offered Thursday nights, and we’ve decided to try it. Our first concert will be Thursday May 30 at 7:00 pm, with our first band, Southland Drive. We hope to have the rest of our schedule ready to show you soon! That address, or donate at the concerts this summer. We hope to have a way to donate online soon. We also plan to keep up our news on Facebook and expand our social media activity on other platforms. We hope to set up our online mailing list soon, so watch for news on that topic. Thanks again and we look forward to seeing you at our first 2019 concert on *Thursday* May 30. We are nearing our goal of $8000 in donations here on GoFundMe, and are "stepping out on faith" with scheduling the 2018 Southland Jamboree, Monday nights beginning July 2. Please don't stop donating; help us reach our goal and possibly have some funds ready for next season as well. Save the Southland Jamboree! Please donate to let our free weekly bluegrass music concerts continue.